Not everyone wants a giant tower CPU cooler. Some people want dual fans and monstrous fin real estate, but some prefer something a bit squatter. 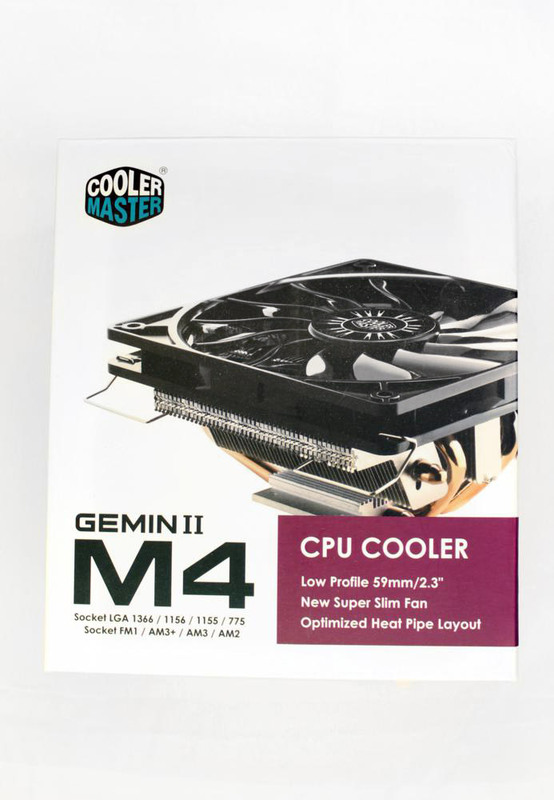 My latest CPU cooler reviews is the Cooler Master GeminII M4, a new low profile cooler. It’s a squat, copper heatpipe sporting, many aluminium finned heatsink fan combo that thanks to its unique shape could cause clearance issues; it’s going to be an interesting review. 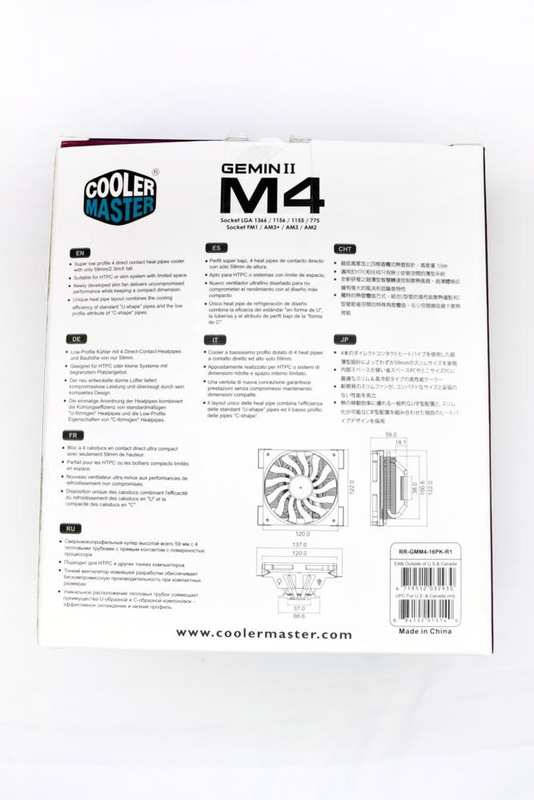 The box of this new cooler is typical of Cooler Master’s new box designs, very professional and clean while still clearly displaying the information you need to decide if this cooler is correct for you. The bundled items include: a manual, AMD and Intel mounting parts, thermal compound and nuts, screws and a nut setter. 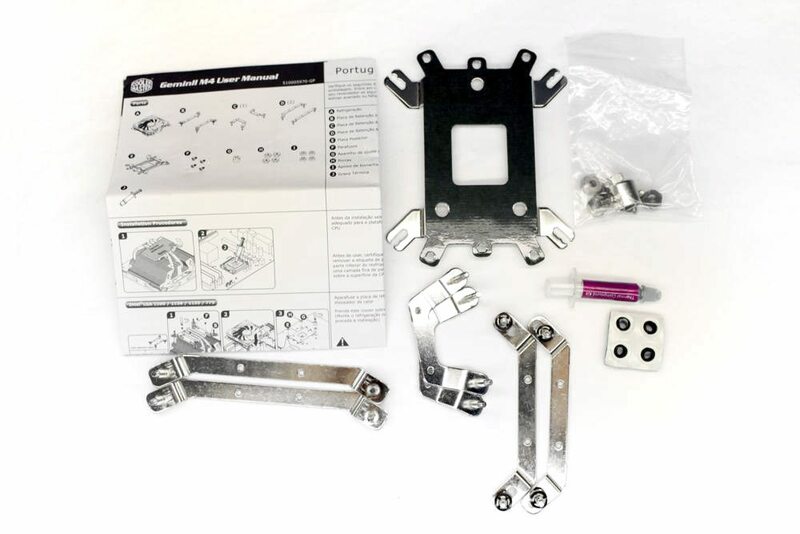 The provided mounting system is another variant of Cooler Master’s mounting solutions. I definitely like this version the most. For my AMD setup, the four included rubber rings needed to be stuck to the motherboard to ensure there is no metal contact with the motherboard. The system was easy to install and very firm once fixed. The thermal paste is the same standard thermal paste Cooler Master provides with all of their coolers. The paste is of a high quality and has a good viscosity for a thermal compound, making sure it spreads well when you mount the cooler.